What MetalsCut4U can do for you? MetalsCut4U will cut and bend your piece of sheet metal just the way you need it - in the quantity you need it. In 4 easy steps. Step 1: What is the metal you need for your project? Step 3: What thickness will you need for your project? 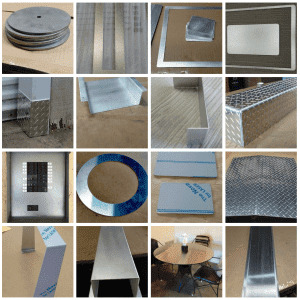 MetalsCut4U offers different thickness. We have pre picked 3 per surface you have chosen. If you need a other thickness then offered, give us a call and we will try to accommodate your purpose. Choose out of currently 14 different forms and shapes, such as rectangle, triangle or circle, just to name 3 forms. Enter your desired measurements and press the calculation button. You will get a price right then and there. If you can’t find exactly what you need, you can send us a CAD file or a sketch of your sheet metal and we will happy to send you a individual quote. Lastly once you have “answered” the 4 easy questions, add your configured sheet metal to the shopping cart, enter your shipping and billing address if applicable and pay.